Conscientious Objectors :: Great War Dundee - This is the story of the 30,490 men that left Dundee to fight in the First World War and of the people left at home. Dundee’s contribution to the war effort was widely recognised but it was also a leading centre for the anti-war movement. At the time an anti-war newspaper – Forward, noted that Dundee ‘was fair hotchin’ wi conchies’ (conscientious objectors, those that refused conscription). 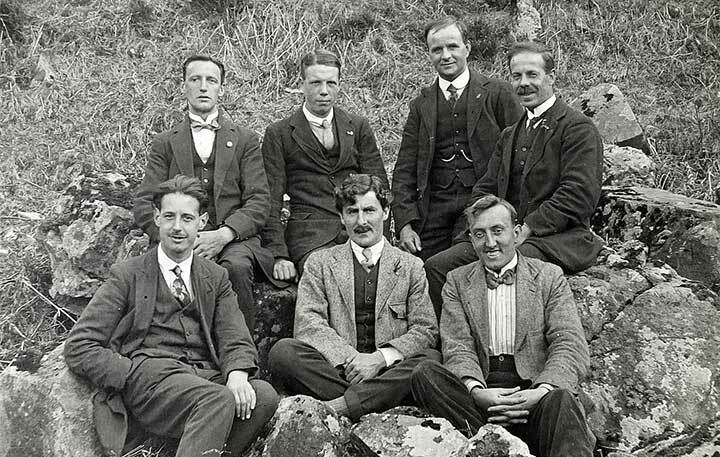 A group of Dundee conscientious objectors. Dundonian Ewan Geddes Carr is at the far right of the back row. 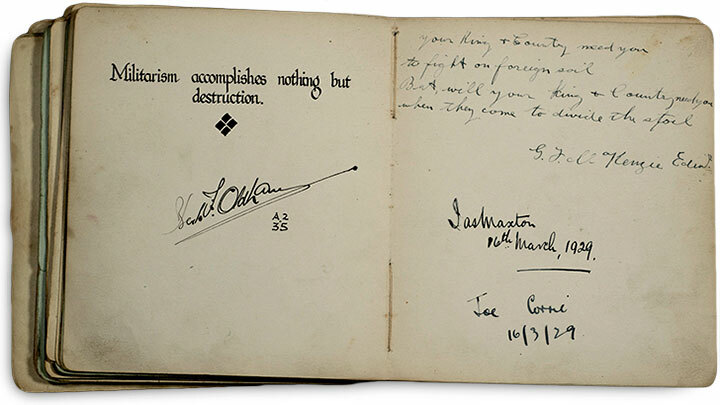 A recent donation to The McManus: Dundee’s Art Gallery and Museum included an autograph book which had belonged to Dundee conscientious objector Ewan Geddes Carr. From a politically aware family raised in the Overgate, Dundee, Ewan was opposed to the reasons for the war and refused to fight. He was sentenced to hard labour and spent his war years travelling round British prisons and camps where he collected autographs and drawings from other conscientious objectors. During his prison sentence Ewan Geddes Carr collected signatures and messages from other conscientious objectors. On the other hand, Ewan’s brother, William, had felt so strongly about going to war that even though he was on the reserved occupation list and could not sign up in Dundee he went down to London and enlisted there instead. After being released from prison Ewan continued a life in politics where his part in removing Winston Churchill as M.P. for Dundee in 1923 is now part of the City’s political history. Picture credits: A group of Dundee conscientious objectors... and During his prison sentence Ewan Geddes Carr collected signatures... Courtesy of Dundee City Council (Dundee Art Galleries and Museum). ED Morel - pacifist and MP for Dundee after famously ousting Winston Churchill in the 1922 election. Will Ellsworth-Jones, We Will Not Fight: the untold story of World War One’s conscientious objectors. Great War Dundee Education Pack. 5 complete lessons set against the context of Dundee during the First World War. Legacies of Resistance to the First World War. An 8 week course about Scotland's conscientious objectors.